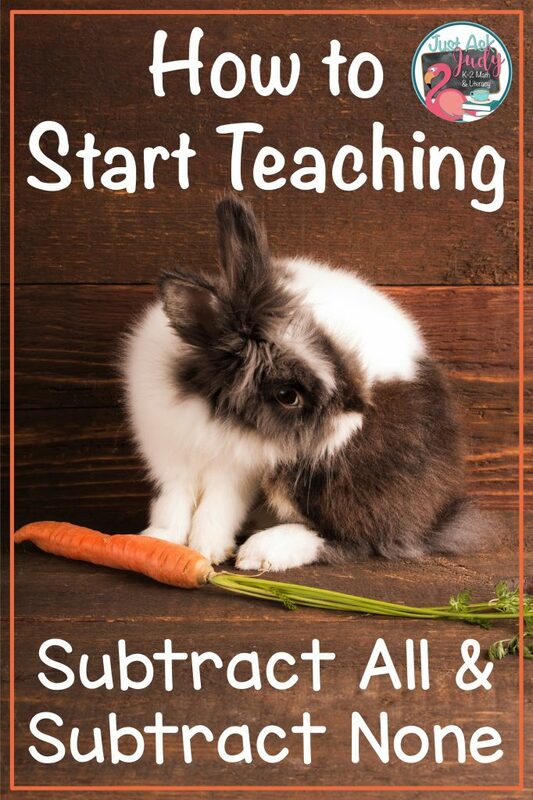 Are you searching for concrete ways to introduce subtraction concepts or strategies? This free hands-on carrot crunching activity for subtracting all or subtracting none of a number can help you build that foundation of understanding in kindergarten, first, and second grades. Is This Subtraction Activity Suitable? Using this activity will help you fulfill the first step in a concrete, pictorial, abstract (CPA) progression of instruction. Moreover, it will also give your students the opportunity to develop a deeper and lasting understanding of the underlying concepts. Use this versatile resource as an introductory lesson for your whole class or small groups or as an intervention lesson with small groups or individuals. You can also utilize it as a follow-up activity in a math station. When working with a large group, you may want your students to work in pairs to reduce your material requirements and preparation. At its most basic level, this resource can be used to develop a conceptual understanding for subtraction of the words all and none. Additionally, it will be helpful for introducing the subtraction fact mental strategies for subtracting zero (none) and subtracting all from a given number. 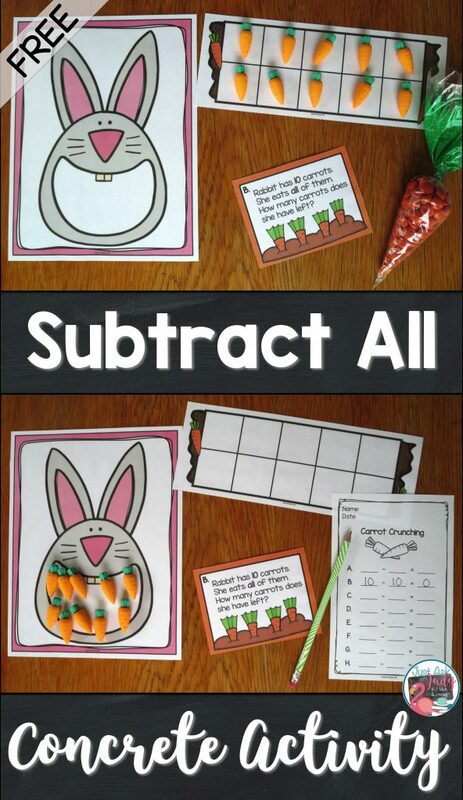 To get started, you will need a big-mouth rabbit mat and 10 counters for each student or pair of students. While carrot erasers are adorable and engaging, the cost makes them an impractical choice for larger groups. Use buttons, pom-poms, the printed carrot counters included in this resource, or any counters you have handy. You also need a set of task cards. There are four sets to choose from, subtract all (word and number) and subtract none (word and number). Choose the set which best matches your instructional purpose. Create your own set of eight task cards by mixing and matching task cards with the same letter. The ten frames mats are optional. They can be used to organize the number of carrots Rabbit has. Likewise, using a recording sheet is also optional. Plain paper and whiteboards work just as well for recording the subtraction equations. Read the problem on your first task card step by step. Students show the number of carrots Rabbit has with their counters. These can be organized on ten frame mats. Students take the number of carrots Rabbit eats and place them in Rabbit’s mouth. Then, they write the corresponding subtraction equation on a recording sheet or whiteboard. Those students working as partners can take turns by task or by problems. Be sure to read this previous post, Subtraction is Not Just Take Away, which includes a freebie for teaching the count up to strategy for subtraction facts. Find additional resources for teaching subtraction facts, including a free one, in my Teachers Pay Teachers store.